Last week, before another three day stretch of crappy weather arrived, we hit the trail to explore more of Arches National Park. Most of the trails in the park are fairly short, which makes it easy to fit more than one hike into a single day. The short hikes also mean that we have plenty of time to be productive around the ‘house’ before or after a visit to the park. Despite the finicky weather, we have managed to hike most of the trails in the park. 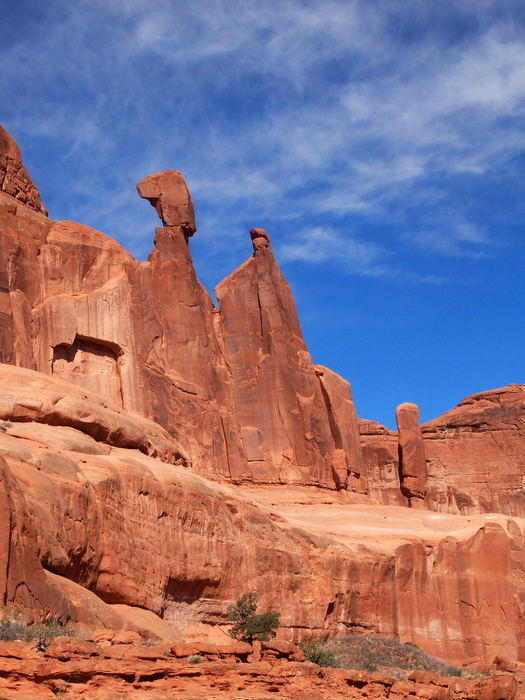 The two exceptions are the Fiery Furnace, which is a ranger led hike, and the Towers Arch, which is in the back country area of the park. 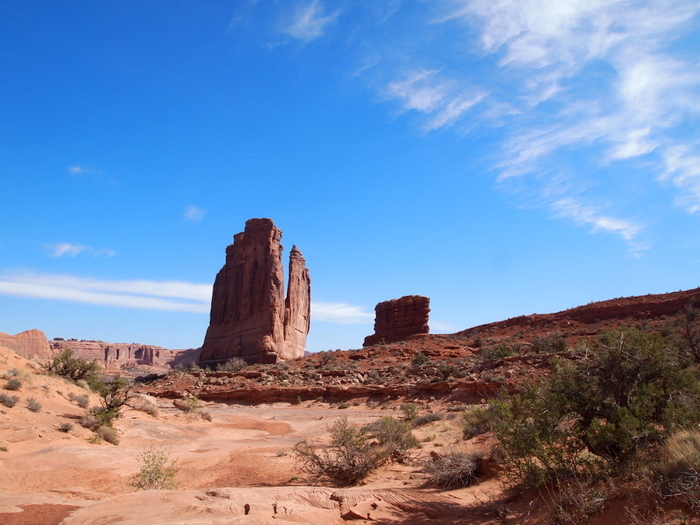 We might skip the Fiery furnace this time around, but the Towers Arch is definitely in our plans for this week or next. 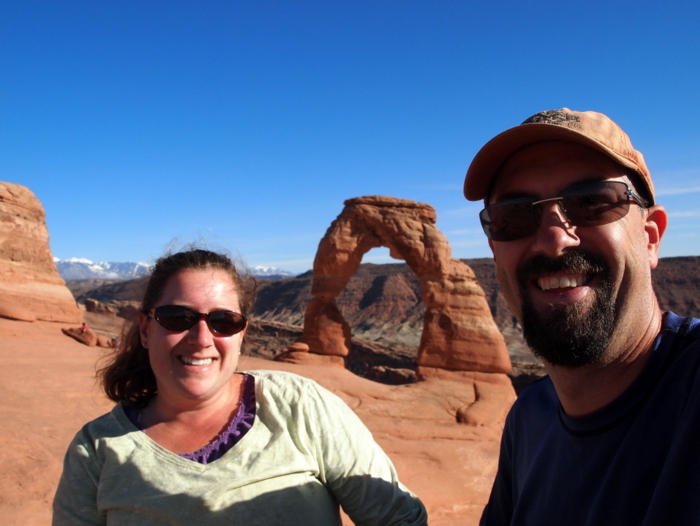 Last Sunday we took a late afternoon hike to the most famous arch in the park. Delicate Arch is the arch most people associate with Arches National Park. 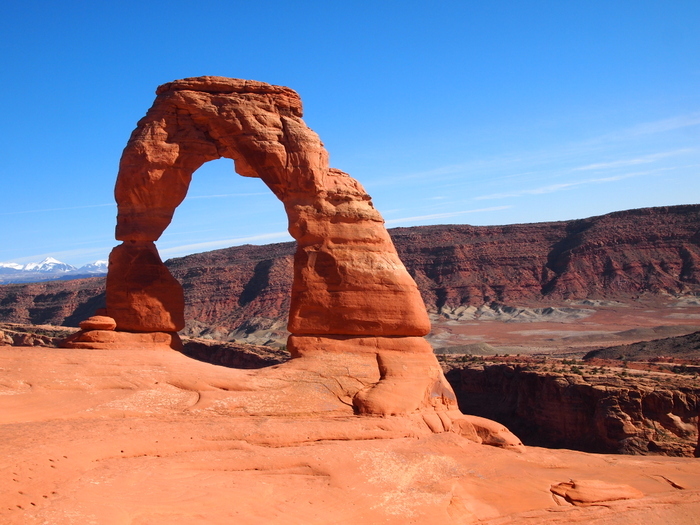 It’s probably the arch most people associate with Utah. It is on their license plate after all. 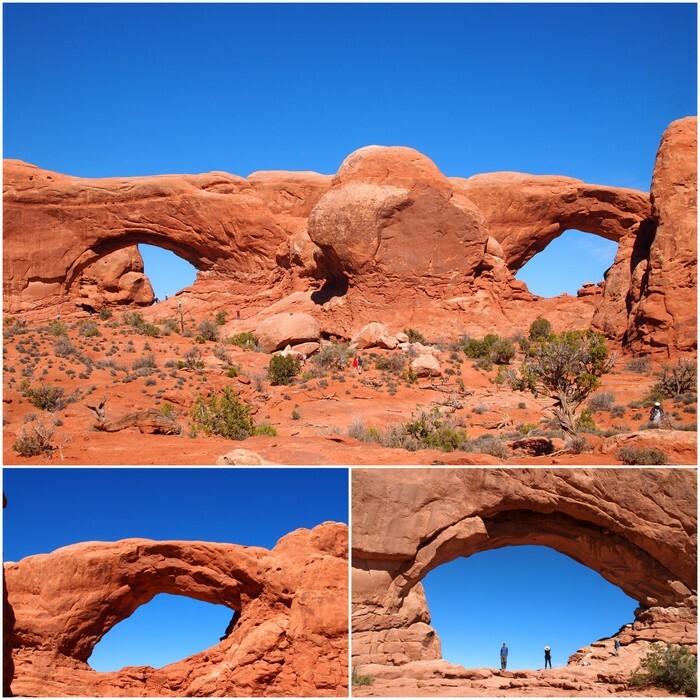 There are two ways to see the Delicate arch. You can drive to a viewpoint, get out of your car, and look at it from a distance. 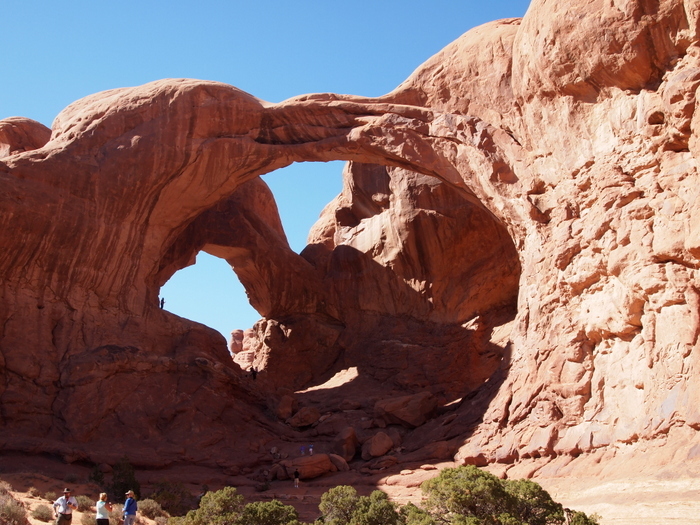 Or you can hike up a 1.5-mile trail and get up close and personal with the arch. We, along with most other people under the age of oh… say 75, chose the hike. 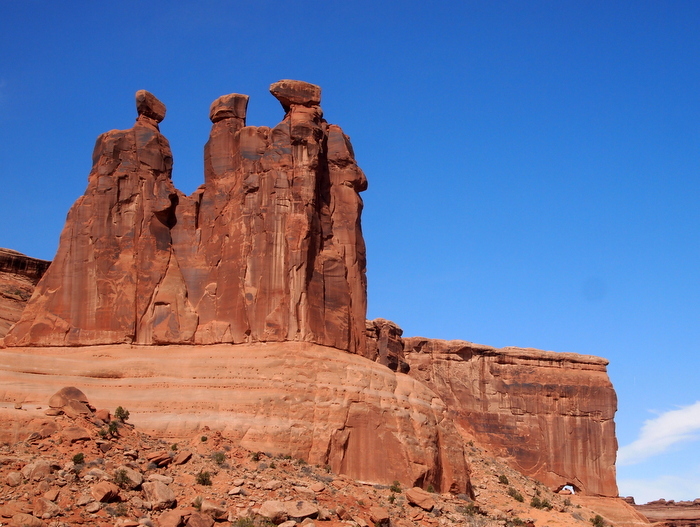 The trail starts with a short uphill, levels out a bit before ascending a wide expanse of steep slickrock, takes a short jaunt through some flattish, rocky terrain, and then finally jogs around a large rock before the arch comes into view. At the bottom of the trail near the parking lot are some ancient Petroglyphs. 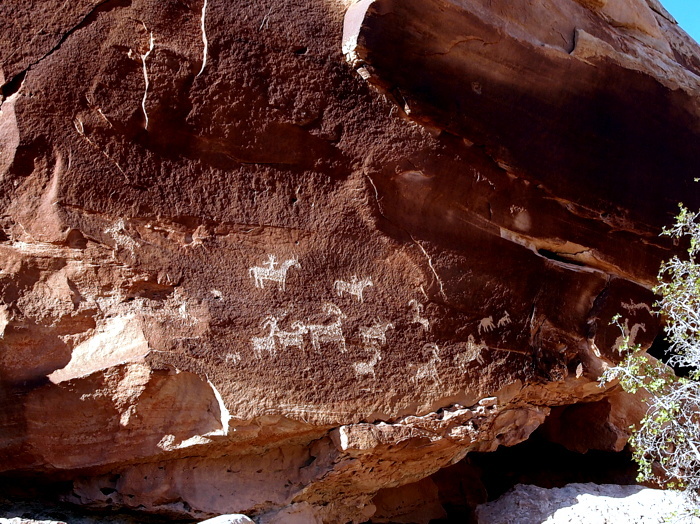 This rock art depicts big horn sheep, men riding horses and possibly dogs. It is believed to be the work of the Ute tribe, and while the date of origin is unknown it was most certainly created after the 1500s when the Spanish reintroduced horses to the area. 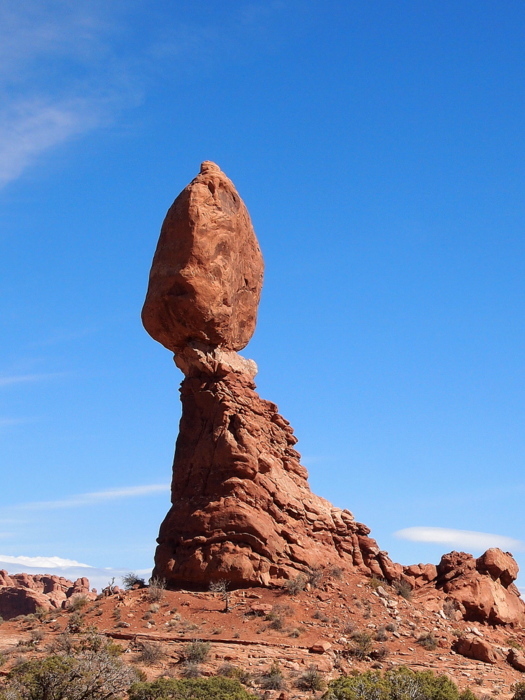 The rock panel is only a short walk from the Delicate Arch parking lot, and well worth a look. Another popular area of the park is the Windows Section. 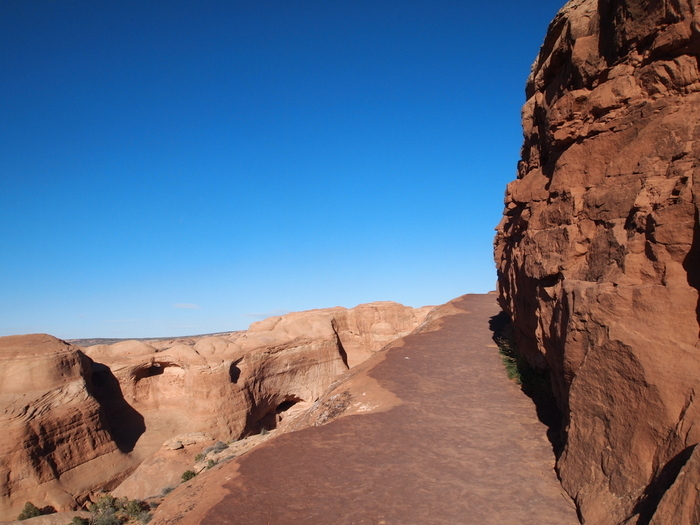 There is a short trail that meanders around the arches providing great views and opportunities to climb up into the arches for photo ops. Provided some random stranger doesn’t get in your way of course. Near the windows is the Turret Arch. 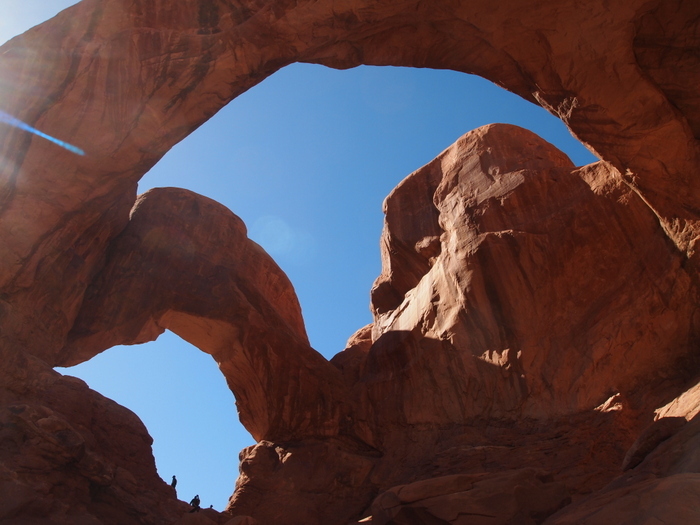 The angle of the late afternoon sun made a close up picture of this arch nearly impossible. Despite the weird lighting, I like this picture because it shows how flat the landscape can be around these crazy rock formations. It’s as if they pop up out of nowhere. 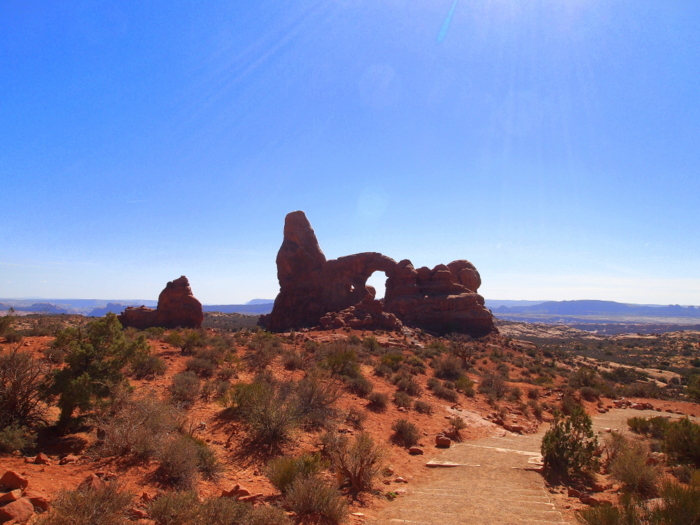 Also near the Windows Arches is the Double Arch. Tim and I agreed that this is our favorite arch in the park. 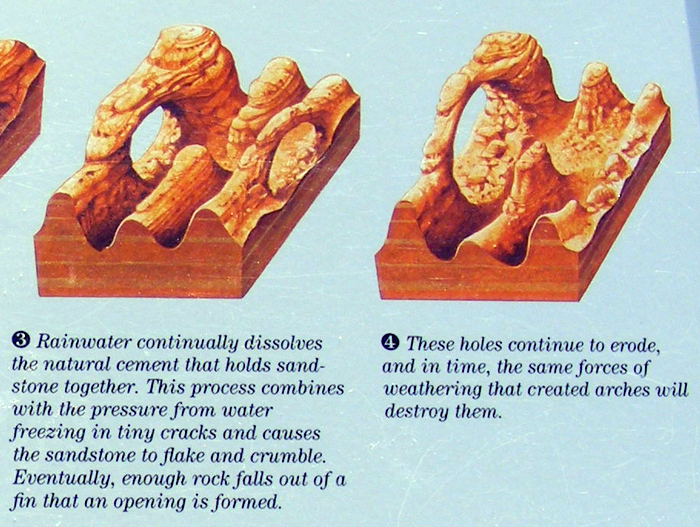 Speaking of arches…here’s a neat set of graphics that explains how arches are formed. 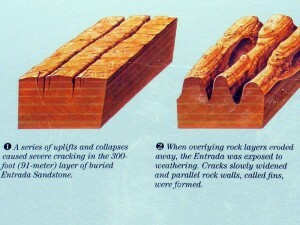 We saw this same graphic all over the park and in the visitor’s center. Click on each photo to make it bigger if you can’t read the writing. 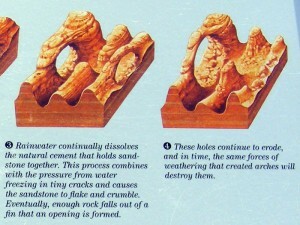 Ready for more pictures of rocks? There’s an area in the park called Park Avenue. 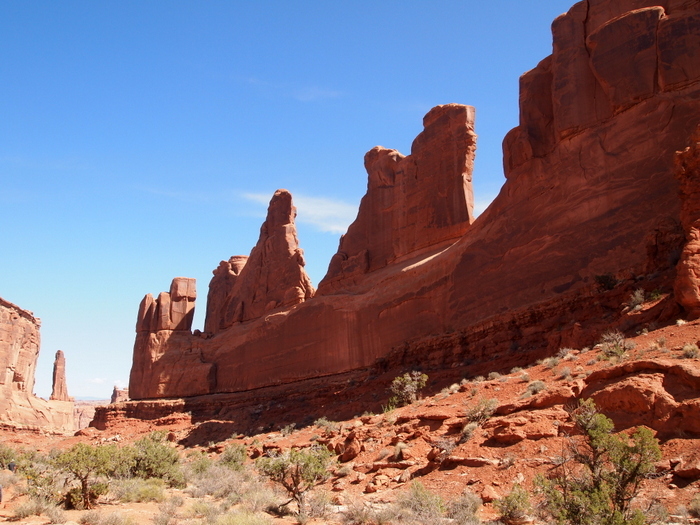 The towering rocks that line the one-mile trail are straight-sided and reminiscent of a tall city buildings. We strolled down Park Avenue around mid-morning when the sun was just starting to peak over the massive rocks. I think this is the rock named “Three Gosspis” on the map…hmmm wonder what they gossip about? That rounds out our adventures in the park. 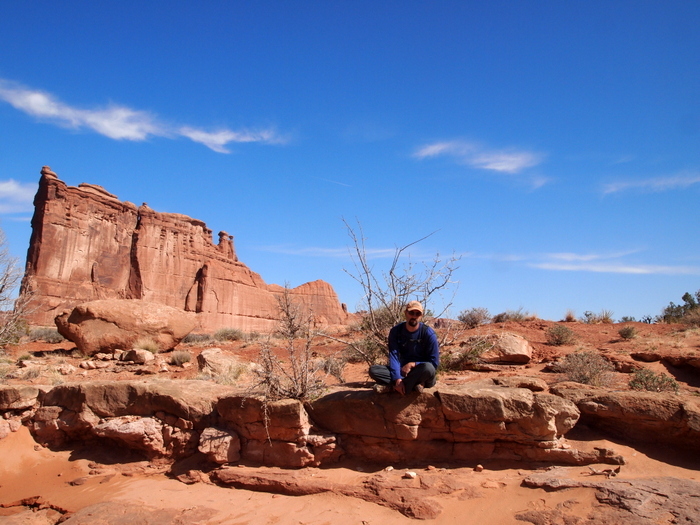 We’ve also been exploring the many trails around Moab outside of the park. These trails are all dog friendly, some even friendly enough for our old dog (he just turned 13!). Think I’ll save those photos for another post though. See you then. What lovely photos. You captured the area and all its beauty. Great job! Beautiful photos! We can’t wait to spend time in Utah. 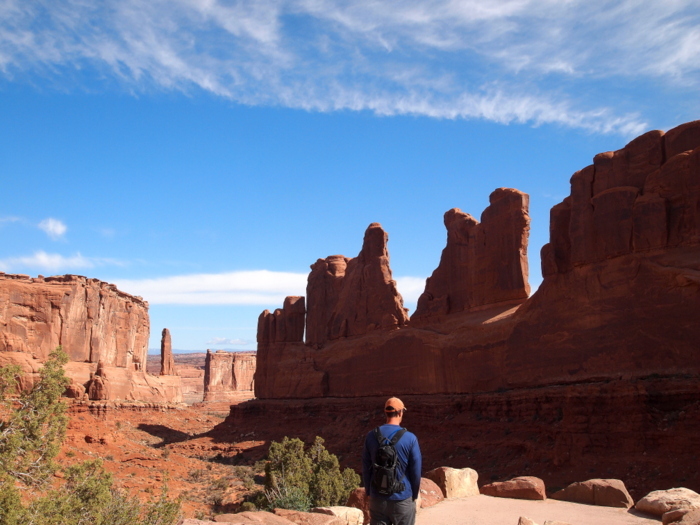 Glad you were able to visit the other arches without too much of a crowd. We’ve been hitting these areas on the less desirable weather days. Definitely keeps the crowds down! You sure had a beautiful spot next to the Colorado River! We travel with our 4 rescue pups…no we are too crazy!…nice to know about the doggie trails too.